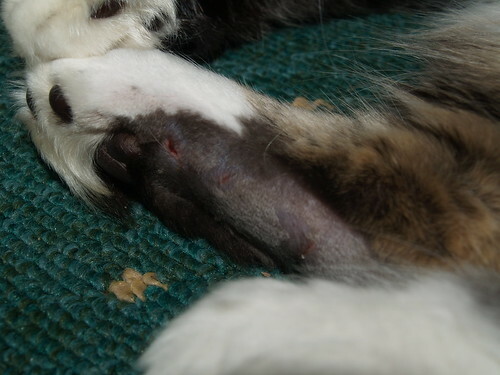 So, when Fudge came back from the vet, he came back with a shaven paw. While he was unconscious, they x-rayed him and did a close exam, including shaving his fur to see what was going on underneath. With the long hair gone, it’s pretty plain to see what’s happened. He has bite marks on his paw, and around, signs of discolouration which point to infection. Cat mouths are dirty so cat bites lead to infection. Since the bite is on the bottom of the rear paw, my suspicion is that Fudge was already running away when he got bitten. The back paw is the last bit of cat to leave! The treatment is more antibiotics – vet was a bit surprised that the first lot didn’t seem to help much, and has given a longer course of the pills. Fudge is hard to pill just like he’s hard to inject, and these pills seem less palatable than Smudge’s which seem to be tastier than real food! If you lived around here, you’d guess it was a fox that bit him. We had to spend an anxious fortnight after a fox bit one of our cats, a decade or so ago; nasty infection of the back leg. Probably, the cat gave as good as he got; he was a big, territorial beastie. But he couldn’t walk for nearly a month! Well, it’s not impossible at all – there are certainly a few foxes around here – there’s a small plot of trees just up the road where I think they live, and you regularly seem them roaming the streets at night. And they definitely come into the garden – there are clear paths. And the previous owner of the house fed them – she had photos of them on the patio. Frank went through a territorial phase of scrapping with other cats every night and coming back in sporting various scratches and injuries the next day. One time he came in limping, looking very sorry for himself and the vet thought that he had possibly been bitten or fallen badly on it. Fortunately it cleared up with antibiotics pretty quickly, and he didn’t want to go out quite so much after that. Get well soon Fudge! It wasn’t me. I was never there. I know nothing.